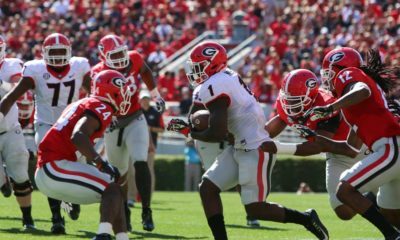 ATHENS, Ga. – Quarterback Hutson Mason passed for 241 yards and a touchdown to lead the Red team to a 27-24 victory over the Black squad in the G-Day Game on Saturday. 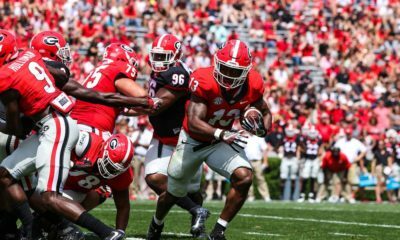 A record-setting Sanford Stadium crowd of 46,073 — eclipsing last year’s mark of 45,113 — and a regional CSS television audience viewed Saturday’s game. Mason went 18-of-27 for 241 yards and the touchdown, including 17-of-25 for 188 yards and the score in the first half. Receiver Chris Conley paced the Red team with six catches for 124 yards, including a 53-yarder from Mason. Tailback Brendan Douglas led the Red team with 40 yards and a touchdown. Tailback Todd Gurley had 32 yards and a score. Tailback A.J. Turman scored two touchdowns for the Black squad, one rushing and one receiving. Receiver Clay Johnson had five catches for 75 yards. Cornerback Sheldon Dawson led the Red team with six tackles. End Josh Dawson, nose Toby Johnson and linebacker Reggie Carter all four tackles, including a sack for Josh Dawson. Cornerback Brendan Langley picked off a pass. For the Black, safety Corey Moore had seven tackles. Cornerback Lucas Redd, linebacker Amarlo Herrera and linebacker Leonard Floyd posted six tackles each. Cornerbacks Tristan Askew and Aaron Davis each had an interception. 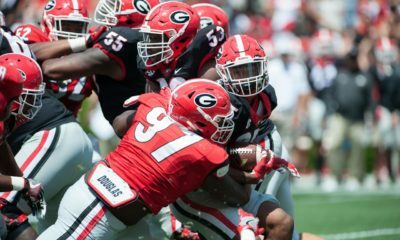 The Black squad had four sacks, two each by Herrera and linebacker Jordan Jenkins. The Red team struck first as kicker Marshall Morgan drilled a 34-yard field goal for a 3-0 lead at the 1:53 mark of the first quarter. The Black squad responded with a 1-yard touchdown run by Turman. Kicker Patrick Beless tacked on the PAT for a 7-3 edge. The Red then scored the next two touchdowns. Receiver Reggie Davis hauled in a 10-yard pass from Mason and Gurley posted a 2-yard run. Morgan had each PAT, giving the Red a 17-7 lead at halftime. Kicker Thomas Pritchard pulled the Black team to within 17-10 as he converted on a 29 field goal with 47 seconds left in the third quarter. At the 11:03 mark of the fourth quarter, Red tailback Brendan Douglas powered in from a yard out. Morgan’s extra point made it 24-10. 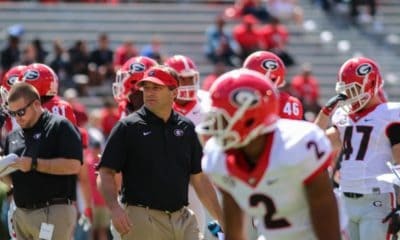 The Black squad got it to 24-17 when quarterback Faton Bauta hit receiver Uriah LeMay on a 41-yard touchdown pass with 4:52 remaining. Beless converted the PAT. Morgan was true on a 30-yard field goal with 2:50 to go to push the Red lead to 27-17. The final score of the day came when Bauta threw a 4-yard pass to Turman with 42 seconds left. Pritchard added the extra point for a final score of 27-24. 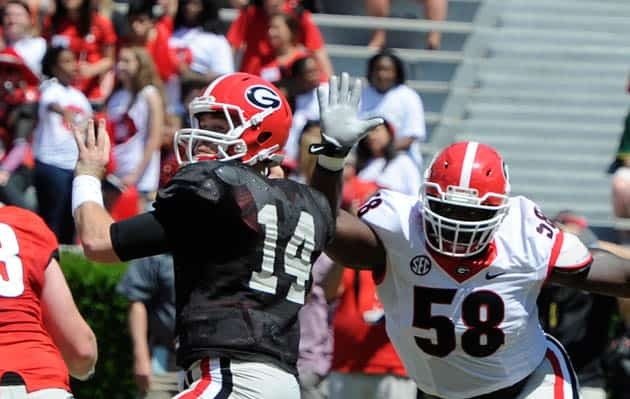 The Bulldogs will open the 2014 season Aug, 30 against Clemson.